The Sundarbans is the largest single block of tidal halophytic mangrove forest in the world. 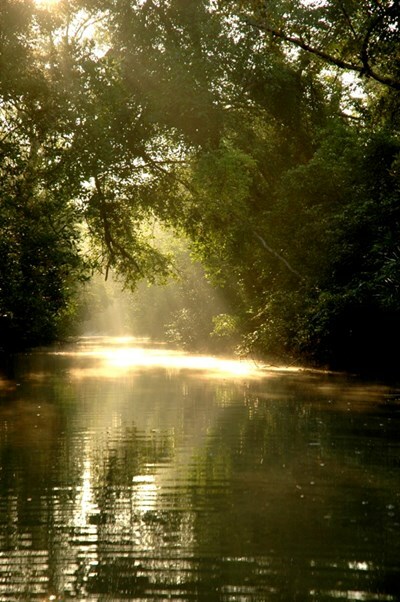 The name Sundarban can be literally translated as "beautiful jungle" or "beautiful forest" in the Bengali language (Sundar, "beautiful" and ban, "forest" or "jungle"). The name may have been derived from the Sundari trees that are found in Sundarbans in large numbers. Alternatively, it has been proposed that the name is a corruption of Samudraban or Chandra-bandhe (name of a primitive tribe). This description uses material from the Wikipedia article on Sundarbans and is licensed under the Creative Commons Attribution-ShareAlike License (view authors). 40 people want to do this. One person has done this.